Which isn't to say the supporting players are slouches. I could have done without the indulgent cameo from Mike Myers, complete with Wayne's World reference, since it's a little too broad (and cutting back to him for no good reason during Live Aid is a bizarre decision – we last saw him a decade earlier – unless the director(s)'s under the assumption the entire audience recognises this as Mike Myers doing a comedy turn and that they want more of him), but his composite character of Ray Foster serves a useful function in emphasising the outré quality of Bohemian Rhapsody (the song). Freddie Mercury's band members are remarkably deft facsimiles, though. If they don't quite come alive the way he does, that's in part because they simply aren't even in the same arena of vitality and fascination, and because – as a consequence – they aren't afforded the same amount of screen time. Gwilym Lee is to be sympathised with for enduring an imitation of Brian May's massive perm, while Ben Hardy gets the closest to a defining presence with Roger Taylor's frequent clashes with Mercury. Joseph Mazzello, like John Deacon, slips by mostly unnoticed, as will this sentence. And if Aidan Gillen wheels out "dodgy Aidan Gillen" again as manager John Reid, minus his more outright Machiavellian aspects, Tom Hollander does his inimitably best Tom Hollander as personable Jim "Miami" Beach, the band's lawyer turned replacement manager. The biggest impressions are made by Allen Leech as Mercury’s personal manager and "bad influence" Paul Prenter, eventually telling all on the singer, and Lucy Boynton (Murder on the Orient Express, Apostle) as Freddie's one-time fiancée and lifelong best friend Mary Austin. If the picture effectively digs into the underlying bleakness and discontent of the period during which Mercury increasingly relied on Prenter, accelerating his gradual dissolution and isolation, it is equally adept at translating the warmth and genuineness of the bond between Austin and Mercury. The picture particularly needs Prenter to provide some dramatic heft. There's little enough genuine conflict in the Queen story – I say this as an admitted ignoramus of lore, so I may be entirely wrong – such that Anthony McCarten and Peter Morgan have to diligently create some, along with various exaggerations of peak points along the way (McCarten is no stranger to such embroidery, having previously refashioned the lives of Winston Churchill and Stephen Hawking in Darkest Hour and The Theory of Everything respectively). Bohemian Rhapsody (the movie) invents everything from the future band's first meeting, to Mercury meeting later love Jim Hutton (Aaron McCusker), to the success of the first album (it wasn't that big), to the split with Reid (actually in 1977), to the reason Freddie finished with Prenter – he trashed Freddie’s house or told all, depending on which fact check you read – to the band breakup (apparently it was agreed by all that a break was appropriate after disco dud Hot Space, and they reunited for The Works in ’83 – which included Radio Ga Ga and I Want to Break Free), to songwriting credits (not actually shared until The Miracle), to the HIV diagnosis (it happened sometime after Live Aid, some suggesting he tested negative in '85 and then positive in '87). None of this is all together less or more than what you expect of a dramatisation (authenticity is what documentaries, ideally, are made for), but the structuring of the Live Aid grand climax – the band in tatters, no one talking to Freddie, their meet-up having not played in forever (they’d actually been on a World Tour with The Works that ended a couple of months before), the fractious relationship with his father resolved on the morning of the concert (his parents "went to most of Freddie Mercury's concerts"), Freddie being diagnosed with AIDS – is a multi-layering of artifice that rather underlines how little their story lends itself to a straightforward, peaks-and-troughs movie structure. That said, this assembly succeeds remarkably effectively, and poignantly, with due time given to the concert and triumphant, band-reinvigorating set. The consequence is that the back end of the movie is the more proficient. There's a big gap between 1975 and 1980 where you'd think nothing of note happened, and consequently we re-join Freddie, expanded tache, house full of cats (with their own rooms), increasingly secluded and yet paradoxically enjoying the gay club scene like a fugitive from Cruising, in a manner that has been lent insufficient prelude (no dwarves carrying trays of cocaine on their heads, though, which will only reconfirm all Sacha Baron Cohen's reasons for departing the project). Malek is genuinely eye-opening in the lead role. He isn't as big as Mercury, but he makes up for it in presence and by inhabiting his subject's persona (admittedly, it's not very much of his voice singing the songs, mixed as it is with Mercury and Canadian singer Marc Matel); an irrepressibly camp, sensitive, preening peacock with a quick tongue and a devil-may-care courting of risk, his performance is one of warmth, self-destructiveness and indomitable self-belief. If you need to ask what the point of making a movie playing not just fast and loose with but observing wanton disregard for the facts was, look no further than Malik. It's a performance deserving of a Best Actor Oscar nod, whether or not he gets one. So yeah, as someone largely indifferent to Queen (which means, I like any number of their songs, but I don't actually own any of their albums), Bohemian Rhapsody (the movie) worked just fine for me. I don't think it's a great musical biopic – very few biopics are great, let alone musical biopics; it's a genre that, by its nature, tends to be reductive, over-reverent and literal, unless made by a director with a clear vision – but it's an enjoyable, often amusing and affecting one, accompanied by an inevitably rousing soundtrack (although, I'd have steered clear of using their songs in the opening sections, until they're an established band). Iconic scenes focus on the inspirations for Bohemian Rhapsody (the song) and We Will Rock You (not the musical), and they elicit a clockwork, breezy enjoyment value given the hindsight of their stature, but for me the standout sequence might be Mercury, loaded, sweatily spinning out during an impertinently probing press conference. And in terms of what might have been, I'm not convinced Sacha Baron Cohen would have been a great Mercury – who knows, perhaps he could have pulled it off, but you'd need to see a track record in dramatic roles before taking the risk – and until Dexter Fletcher gives an interview there's no way of ascertain how much persona non grata Bryan Singer (at least, it seems, outside of a Red Sonja set) contributed to the final film. 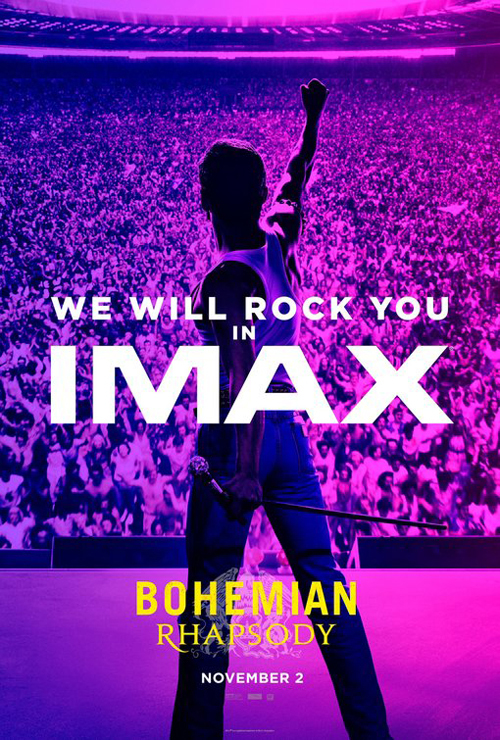 Bohemian Rhapsody, the movie, on a scale of Queen tracks, might not entirely rock you and doesn't quite break free into greatness, but in its own way (not least at the box office), it's definitely a champion. Excuse my biased opinion (being a massive queen fan) but this cast portray the band and Mary Austin superbly. I understand the movie took ten years to make, something to do with disagreements between the director and Brian May/roger taylor!!! Well let me tell you this, it was well worth the wait. The amount of studying and research these young actors must have did is clearly testament to their performance in this phenomenal story of the greatest band ever to grace the earth. Without spoiling the film, all I can say is that a certain record producer must be gutted or certainly would have been. Definitely two and a quarter hours of your life you will never forget. By far the best film containing music about a life story I've ever seen.